It there a command line or GUI tools to dump information about ICC Profile/color conversion, which are set "Color management and PDF/X options for PDF" option of Illustrator's PDF export dialog? 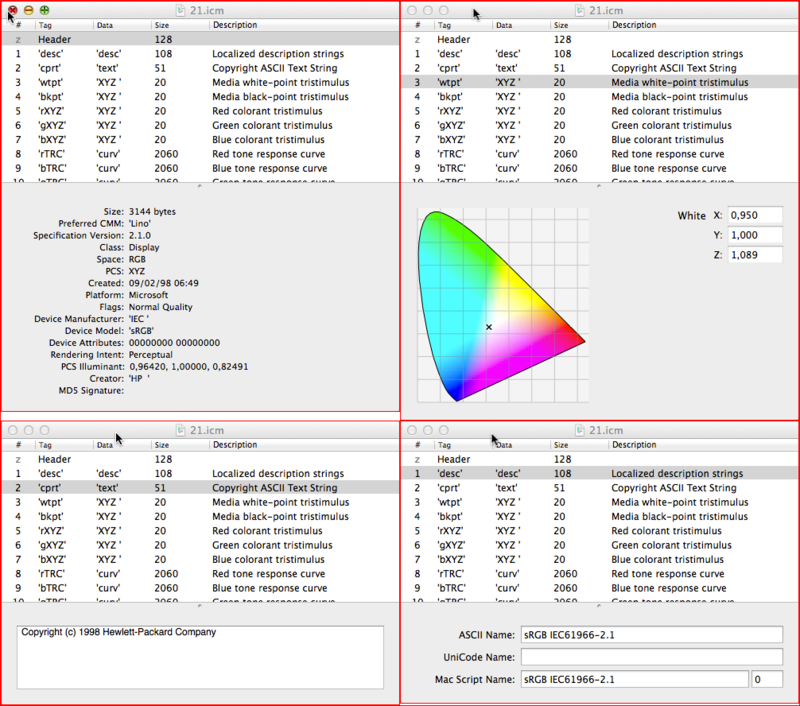 Here is a command line based method to extract ICC color profiles from a PDF. It uses the Python script pdf-parser.py written by security researcher Didier Stevens which you can download here. However, this tool is not a specialized tool for ICC extraction. (I do not know such a tool.) It is a generic command line tool to investigate PDF files. Therefor you need to go through various steps in order to achieve the extraction. It seems that an ICC profile is to be found in PDF object 21. The PDF object 21 contains a stream (the contents of which are not shown by using the -o 21 parameter of pdf-parser.py). The object stream has to be de-compressed with the /FlateDecode in order to get to its content. -d filename in order to dump the stream of PDF object 21 to a file. -f in order to filter/un-compress the object stream when dumping it to a file. ArgyllCMS contains a command line tool, extracticc, which can extract an embedded ICC profile from a TIFF file. It does not have a tool to extract a profile from a PDF file. There are two common locations where ICC profiles can be stored / used in PDF files. Either attached to images or stored in the PDF/X output intent area of the PDF file. Tools such as callas pdfToolbox (warning, I am affiliated to this company!) and Enfocus Pitstop are capable of showing all color information in a PDF file, either through a GUI or using (in the case of pdfToolbox a command-line interface). Not the answer you're looking for? Browse other questions tagged pdf adobe-illustrator color-profile color-management or ask your own question. GhostScript 9 / ICC Profiles - can this be used to convert a single colour in a PDF from RGB to CMYK? Ghostscript: why must I provide a pdfa_def.ps for PDF/A conversion?